The redbud tree (Cercis canadensis), commonly called the eastern redbud, is a native North American flowering shrub or small tree. There are a number of varieties of redbud, hardy to USDA zones 4 through 9. The tree grows to 30 feet in height with a 25-foot spread and blooms in white, purple or pink flowers, adding a splash of color to the garden. 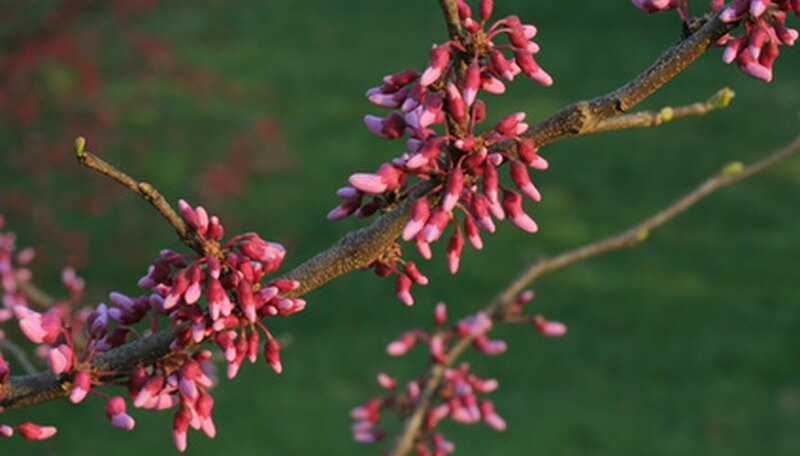 Plant your redbud tree in the late winter or early spring. Place the bare-root redbud tree in a bucket of water while you prepare the planting area. Till the soil, to a depth of 12 inches, within a 10-foot radius of the planting site. Amend clay soil by adding a 4- to 6-inch layer of compost to it and mixing it to a depth of 12 inches. Dig a planting hole for the redbud tree. Measure the depth and the width of the nursery pot in which it is planted (if it's in a container) and dig the hole to that depth and three times the width. If the tree is bare-root, look for the soil line on the lower trunk, indicating the depth at which it was previously growing. Dig the hole three times the width of the root ball. Remove the redbud tree from the planting container or the bucket of water in the case of the bare root tree. For containerized trees, carefully pull the fine roots away from the rootball and gently remove any compacted soil within the ball. Place the roots of the container-grown redbud tree in the hole and fill the hole with soil. If the tree is bare root, build a mound of soil in the bottom of the hole, place the roots on top of the mound and spread them around the circumference of the mound. Backfill the hole with soil. Press lightly with your hands around the base of the tree after planting. Water the redbud tree until the water puddles and keep the soil moist, not soggy, at all times. Spread a 2- to 3-inch layer of mulch around the tree, 6 inches from the trunk and spread out to the dripline (the tips of the tree’s widest branches).